VANCOUVER, BC--(Marketwired - January 26, 2017) - Arizona Mining Inc. (TSX: AZ) ("Arizona Mining" or the "Company") announces the results of three (3) exploration drill holes from its current program on the Taylor zinc-lead-silver sulfide deposit located on its 100%-owned Hermosa Project in Santa Cruz County, Arizona. This brings the total number of drill holes reported in the 2016-2017 program to fifty-six (56). For a full list of the vein and CRD mineralized intervals from these holes please refer to Table I below. CEO Jim Gowans commented: "The latest drill results continue to support the continuity of the deposit with respect to thickness and grade within the resource area, however the most notable interval in today's results is the high-grade zinc/lead/silver from the lower portion of HDS-399. This is the best interval we have encountered to date from the lower carbonate sequence and provides encouragement for potential resource expansion at depth." 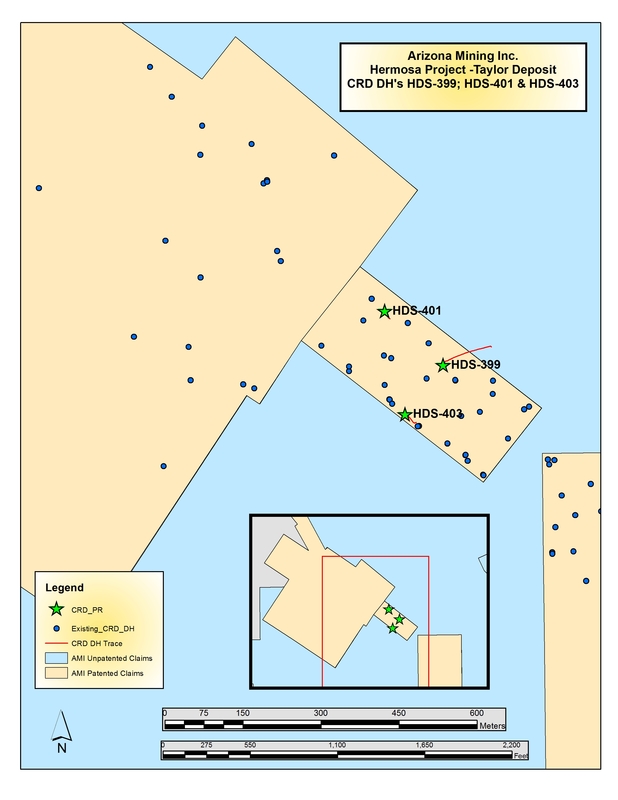 Drill intersections with a combined zinc and lead grade of greater than 9% are bolded. CRD drill intervals are down-the-hole drill widths but are considered to be within +/- 5% of true width based on the dip of the ore body at 22 degrees. The exception to this are the intervals noted as veins. It is not possible to determine the true width of the veins based on the drill density and no representation is made here regarding true width of the veins. The results of the Arizona Mining Inc. drilling have been reviewed, verified and compiled by Donald R. Taylor, MSc., PG, Chief Operating Officer for Arizona Mining Inc., a qualified person as defined by National Instrument 43-101 (NI 43-101). Mr. Taylor has more than 25 years of mineral exploration and mining experience, and is a Registered Professional Geologist through the SME (registered member #4029597). To ensure reliable sample results, the Company has a rigorous QA/QC program in place that monitors the chain-of-custody of samples and includes the insertion of blanks, duplicates, and certified reference standards at statistically derived intervals within each batch of samples. Core is photographed and split in half with one-half retained in a secured facility for verification purposes. Sample preparation (crushing and pulverizing) has been performed at ALS Minerals Laboratories, an ISO/IEC accredited lab located in Tucson, Arizona. ALS Minerals Laboratories prepares a pulp of all samples and sends the pulps to their analytical laboratory in Vancouver, B.C. Canada for analysis. ALS analyzes the pulp sample by ICP following a 4-acid digestion (ME-ICP61 for 33 elements) including Cu (copper), Pb (lead), and Zn (zinc). All samples in which Cu (copper), Pb (lead), or Zn (zinc) are greater than 10,000 ppm are rerun using four acid digestion with an ICP - AES finish (Cu-OG62; Pb-OG62; and Zn-OG62) with the elements reported in percentage (%). Silver values are determined by ICP (ME-ICP61) with all samples with silver values greater than 100 ppm repeated using four acid digestion with an ICP-AES finish (Ag-OG62) calibrated for higher levels of silver contained. Any values over 1,500 ppm Ag trigger a fire assay with gravimetric finish analysis. Gold values are determined by a 30 gm fire assay with an ICP-AES finish (Au-ICP21). Arizona Mining Inc. is a Canadian mineral exploration and development company focused on the exploration and development of its 100%-owned Hermosa Project located in Santa Cruz County, Arizona. The Taylor Deposit, a zinc-lead-silver carbonate replacement deposit, has a resource of 31.1 million tons in the Indicated Mineral Resource category grading 10.9% zinc equivalent ("ZnEq") and 82.7 million tons in the Inferred Mineral Resource category grading 11.1% ZnEq both utilizing a 4% ZnEq cutoff grade calculated in accordance with NI 43-101 guidelines (refer to the Company's news release dated October 31, 2016). The Taylor Deposit remains open to the north, west and south over land controlled by the Company and will be aggressively drilled to test the limits of the resource. 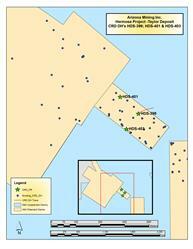 The Company's other project on the Hermosa property is the Central Deposit, a silver-manganese manto oxide project. Certain information contained in this press release constitutes forward-looking statements. All statements, other than statements of historical facts, are forward looking statements including statements with respect to the Company's intentions for its Hermosa Project in Arizona, including, without limitation, performing additional drilling and metallurgical testwork on the Taylor Deposit. Forward-looking statements are often, but not always, identified by the use of words such as may, will, seek, anticipate, believe, plan, estimate, budget, schedule, forecast, project, expect, intend, or similar expressions. The forward-looking statements are based on a number of assumptions which, while considered reasonable by Arizona Mining, are subject to risks and uncertainties. In addition to the assumptions herein, these assumptions include the assumptions described in Arizona Mining's management's discussion and analysis for the year ended December 31, 2015 ("MD&A"). Arizona Mining cautions readers that forward-looking statements involve and are subject to known and unknown risks, uncertainties and other factors which may cause actual results, performance or achievements to differ materially from those expressed in or implied by such forward-looking statements and forward-looking statements are not guarantees of future results, performance or achievement. These risks, uncertainties and factors include general business, economic, competitive, political, regulatory and social uncertainties; actual results of exploration activities and economic evaluations; fluctuations in currency exchange rates; changes in project parameters; changes in costs, including labour, infrastructure, operating and production costs; future prices of zinc, lead, silver and other minerals; variations of mineral grade or recovery rates; operating or technical difficulties in connection with exploration, development or mining activities, including the failure of plant, equipment or processes to operate as anticipated; delays in completion of exploration, development or construction activities; changes in government legislation and regulation; the ability to maintain and renew existing licenses and permits or obtain required licenses and permits in a timely manner; the ability to obtain financing on acceptable terms in a timely manner; contests over title to properties; employee relations and shortages of skilled personnel and contractors; the speculative nature of, and the risks involved in, the exploration, development and mining business; and the factors discussed in the section entitled "Risks and Uncertainties" in the MD&A.